Perhaps the main issue with I Will Miss You When You’re Gone is that, despite promising to discuss the effects and experience of living with grief, it gets so caught up in the throes of ghost politics that it all but forgets to do what it set out to. To explain what I mean by this, this play comes in at just over an hour in length. One would think that in this time there could be plenty of discussion of what it means to grieve and eventually move on, but this just doesn’t happen. Instead, much of the time seems to be taken up with the minutiae of who can or can’t see who and why. Certainly, this could be of interest, but it felt to me that it seriously overshadowed what the play allegedly set out to do. There were many points at which it became evident that, for all the talking, the plot was not really growing or progressing. Instead, it felt like it was managing to go in circles without breaking any new ground. Additionally, while not all of the acting was wonderful, there was also a strong sense that this would be a challenging piece to perform extremely well. Far too many of the lines jarred uncomfortably, and some moments just felt so unnatural that it was virtually impossible to take them seriously. Most of the time, it would be hard to really blame the actors for this. The issue clearly lies far more with Jessica Moss’ original material. However, I didn’t get the impression that the direction (Vuqun Fan) pulled much out of the text. It was frequently hard to discern just why the characters were doing what they were doing as their motivations were never really made clear. Because of this, many of the momentary snapshot scenes (all too frequently sandwiched between painfully extended blackouts) just didn’t quite make sense. Given the simplicity of the set (Aiden Connor) and the small size of the cast, it would be hard to justify any blackouts between scenes at all, and yet these were often long to the point of distraction. If these quick successions of small scenes are to work, there must be a better way to do that than cutting the play off for twenty seconds every time. Despite these issues, I can’t write this play off. Perhaps if the director and cast manage to hone their focus in on the elements of the text that explore real issues, these can be more visibly drawn out. If that is possible, then there’s no reason why this play couldn’t evolve into a very valuable voice in the conversation surrounding grief, and on how we as a society deal with it. 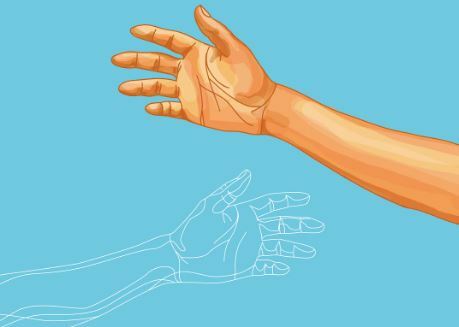 There is some important material in there – there’s discussion of how isolation plays into mental health issues, how humans respond to grief and what it means to succeed. If these issues can be brought to the forefront, that would be a good place to start. 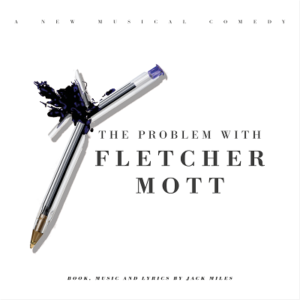 The Problem With Fletcher Mott could have chosen to be a heavy, hard to digest piece of theatre. Dissecting the role that personal and professional anxiety play in creative processes could easily be an immense task that leaves its audience drained and unmotivated. 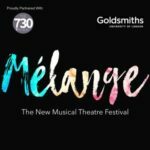 On the other hand, this piece of theatre, put together confidently by students from Goldsmith’s University, held a strong sense that this specific brand of anxiety is only as powerful as we allow it to be – and, what’s more, that perhaps it’s necessary in small doses for any kind of creativity to take place. There were certain elements of the structure that were perhaps a little outdated: presenting anxiety in a physical form does feel a bit like an easy fix to the enormous problem of how to represent mental health issues on stage. However, I would definitely prefer to focus on what this piece is saying rather than how it says it. Amid a comedically mountainous heap of problems: The dream girl stolen swept off her feet by a more successful, more popular upstairs neighbour, the looming deadlines for new work and the ever present ghost of a past successful play that came and went six years ago, there’s a very emotionally well tuned message. That said, it never becomes preachy. The protagonist is far from always right, and neither is anyone else. Instead, the entire cohort of characters just spent an hour and a bit being horrified by the extent to which everyone around them could be wrong, and personally I think that worked better. All in all, The Problem With Fletcher Mott was just funny and genuine and well meaning, and really that’s all it needs to be.